I'm finally accepting that this isn't just the busy season of the year, it's the busy season in my life! There's a lot going on... it's rich, it's full and it often takes my breath away. Sometimes I forget how to stay grounded. I stumble without reminders to stay present and grateful for all that is and not get caught up in the mind's busy chatter. When I share these thoughts with you, I'm always surprised by the tremendous response. Obviously, I'm not alone in this struggle. I have many helpful books in my library and inspiring podcasts to listen to, but those little words I left around my home seemed to have worked more than anything else! (Yay for handmade solutions!) But I'm not always home. In fact, the times that I'm out and about are when I'm usually juggling too many balls and losing my balance. What if I wore my reminders or kept them tucked into coat pockets? Maybe add some lavender to the mix because its scent has always soothed, calmed, and led me back to my center with a few deep inhales. 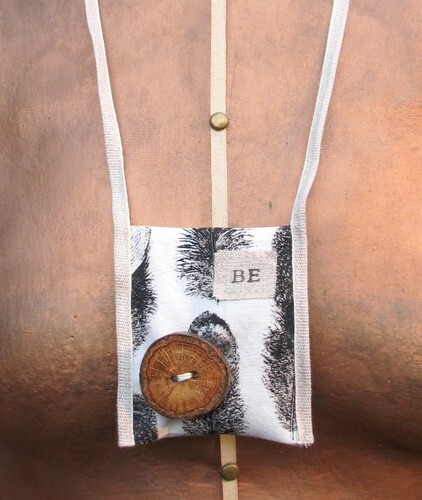 The above "BE" amulet is lightly filled and can be worn close to the heart or tied to the handle of a handbag for easy holding. The wooden button was hand crafted from a reclaimed branch of a sturdy oak tree and is smooth to the touch. I found it here, where they have a huge variety of beautiful tree branch buttons. The back side was printed with my crow. It remains one of my favorite stamps because it was inspired by a photograph of a crow getting ready to soar from the tree outside my studio window. Its image always gives me courage to leap. So that's what those mysterious components were all about: wearable reminders. It actually began with some cuffs. 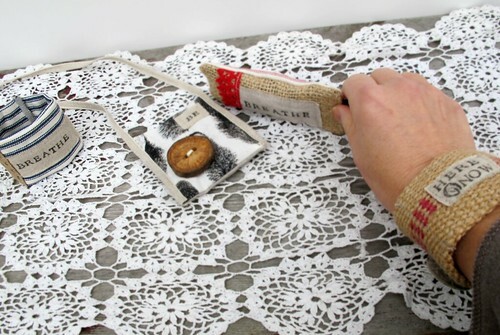 First, I made the skinny little "breathe" sachet to tuck into a pocket. I added the crochet trim from my friend Sonia to incorporate a little friendship and support. It's tiny but powerful. Then, I thought how nice it would be to display words on your wrists... where you can't miss them. 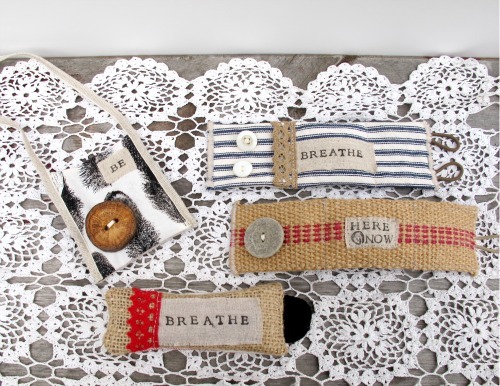 These cuffs were crafted with a thin center pillow of lavender. They're are all spoken for, but I bet you could make your own version. What a simple gift for yourself or someone you love. Perhaps a little tutorial is in order for lavender wearable reminders: to stay present in the moment. I can almost smell the lavendar. I am in a busy season too. Sometimes I catch myself thinking that I'll have to put some things off till the end of this pregnancy, and then I realize how incredibly silly that thought is! My time is not going to multiply with a newborn added to the mix! We really do just have to embrace whatever our "is" is. :). This is an idea that I LOVE! Our daily mantras are really important to push us through the day and into our authentic selves. I used to have a favorite quote on the wall that read "Now what is more important?". It always helped to stop evaluate and reframe my thoughts. I need to bring it back in a very real way. Thanks for this! what a wonderful idea. i usually do a not so pretty version of this with poster board and markers, taping my word up where I can easily see it, but I like your idea waaaay better. Just beautiful maya! So hard to choose! I love the after the calm - simple antique brass vintage key necklace. Among everything else. love this. inspired! just what i need for this busy time. am teaching 3 classes today. i will keep your words in mind to help me keep calm & focused. Just beautiful maya!I like your idea waaaay better. I love every component. Beautiful reminders to stay in the now. Love the materials you have used. wow! Love them. Maybe I'll make one today. I think my word is "home." It will be a little piece I take with me wherever I go and also a reminder that home can be wherever I am (here now!). What a great idea :) Your post was a reminder to me in general to slow down and breathe a bit - it's been a rough morning and that helps. Thanks! Love to see the result. Love these, Maya. Lately I've been feeling this need to carry reminders of love, friendship, and inspiration on my person too. Yours, as everything you do, are beautiful. Completely wonderful! I figured that they would be sachets but never in a million could I have guessed wearable ones. 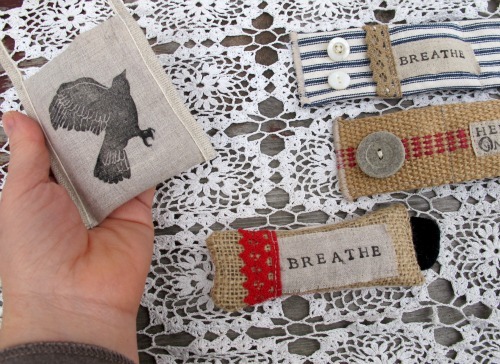 Visual textural inspirational aromatherapy jewelry... Your creative nature knows no bounds! Thanks for the reminders to "breathe" and just "be". It's a great idea. I love the wooden buttons. what a fabulous idea! i love it. i will definitely be making some. thank you, again, for the inspiration, maya. btw, congratulations on the in-print recognition; the jumbo bucket is great and wonderfully in keeping with your repurposing into beautility creed. kudos! beautility!!!!ack! my new favorite word! Great idea! So many great ideas. me too. gah! good idea. nice . I like this so much.. I have been on the same track using words .denim and a stitch ..